A rotary ditcher arrived on Heron Meadow at Nene Park, Peterborough, the week of 23 July to begin work on the Bringing Nature Closer project; restoring Heron and Goldie Meadows back to wetlands. The aim of the works is to benefit breeding, migrating and wintering birds and other associated wetland species - and also create wildlife watching opportunities for our visitors. We really will be bringing nature closer to you. Heron Meadow and Goldie Meadow have long been identified as in need of restoration. Over the years, the existing ‘cross ditches’ dividing Heron Meadow have become heavily silted due to rainfall, impeded drainage and flooding. This has meant that the meadows are often waterlogged in winter but the ditches dry out rapidly in the spring. By reinstating the ditches and creating further scrapes and pools on the meadows, the water will stay on the meadows for longer and so attract more birds and wildlife. This project is being funded mainly by the Heritage Lottery Fund as part of the wider Nenescape project and also by the Environment Agency, the Mick George Community Fund and a sizeable donation from the family of Terry Hadoke, a former Nene Park Trust Trustee. Nene Park Trust has been working in partnership with Nenescape, the Environment Agency, The Wildlife Trust, Natural England and Froglife. Keeping water on Heron and Goldie Meadows in the winter will attract waders such as snipe and lapwing and ensuring the meadows stay wetter for longer in the spring and early summer will attract breeding wading birds such as redshank. These conditions will also provide vital feeding for passage waders that are migrating along the Nene Valley flyway on their way to northern breeding grounds. 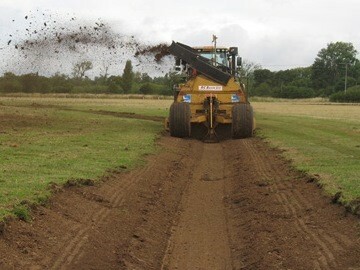 The week of the 23 July was when the RSPB rotary ditcher arrived on site. The RSPB imported this unique machine, the only one of its kind in the UK, from the USA in 2012 with the support of WREN. Operated by specialist contractors R.C Baker Ltd, it was used to create areas of shallow water with scrapes, pools and foot drains. After starting with Heron Meadow, it then moved onto Goldie Meadow soon after. In August a tracked excavator will be brought in to restore the deeper cross ditches. Two viewing platforms will be built overlooking Heron Meadow and one overlooking Goldie Meadow so visitors can see both the ongoing works and also the birds and wildlife when they start to arrive. There will be information to read about the developing project at these viewing platforms, as well as information on the birds and wildlife to look out for. All work should be completed by Autumn 2018 and so bring your binoculars along to spot the growing numbers of birds to both Heron Meadow and Goldie Meadow.